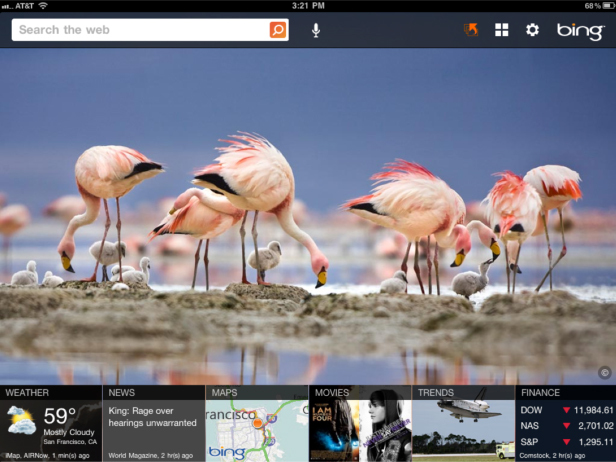 Today, Microsoft launched Bing for the iPad, an app that integrates the company’s search experience with Apple’s tablet. In essence, it’s no different than Google’s iPad app: You’ll find all the features you’d expect from Bing (search, maps, etc.) optimized for the device’s touch-screen interface. However, Bing’s app is far more visually pleasing. Of particular interest are two features: Bing News and Trends. On Google, we know what to expect: lots of blue links. On Bing, the experience has undergone a visual upgrade. The News section is now a Pulse-like experience, featuring headline images arranged by category on a scrolling display. The Trends section is even more visually rich, with splashy pictures highlighting the top trending searches for the past seven days. The point, says Weitz, is to start moving search away from the traditional text-and-blue-link design an into a more visual realm.